Only Spider-Man can protect his fellow New Yorkers from the formidable villains that threaten the city. With the emergence of Electro, Peter must confront a foe far more powerful than he. 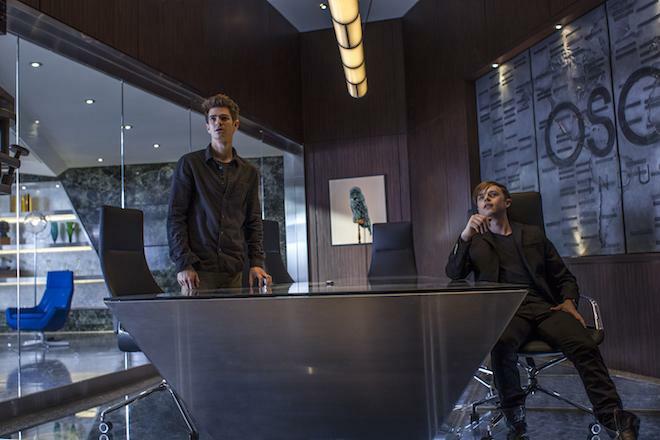 And as his old friend, Harry Osborn, returns, Peter comes to realize that all of his enemies have one thing in common: Oscorp. Garfield brought multiple layers and likability to the Peter Parker/Spider-Man character that Tobey Maguire never did. And while I will always love Raimi’s first two Spider-Man films, possibly because they have Bruce Campbell in them, I will always resort to these new ones, because they’re just that much more fun and better made. But what got me nervous about this sequel is that when the trailers started airing, we saw bit by bit that there was going to be not one, not two, but three villains. It seems like a lot of story line and character development to fit in the span of a couple of hours. Several directors have tried this before and have failed miserably. Luckily for all of us, Webb has done an outstanding job, concocting the story lines to produce a forward moving and fluid pace and story arc. The results are highly entertaining and almost perfectly done. This sequel starts off with a flashback that shows us what actually happened to Peter Parker’s parents and why they left him with his aunt and uncle, which is very similar to the opening of ‘The Dark Knight Rises‘. Then we are off swinging through the city with Spider-Man as he is trying to stop a mad man (Paul Giamatti) who is in a large truck full of some chemical, plowing through cars and people, evading the cops. Webb uses his camera so gracefully and perfectly that I could literally spend hours on end swinging with Spidey through the city. It’s definitely a rush. It’s graduation day as well, and Gwen Stacy (Emma Stone) is number one in her class as Parker is trying to get to his own graduation to see her speech and walk across the stage an accept his diploma. Gwen and Peter still have a great relationship, but Peter still struggles with seeing visions of Gwen’s dad (Denis Leary) throughout the day who reminds him to stay away from Gwen for her safety. This was really a low point of the movie and felt very cheesy, but was trying to foreshadow for later circumstances. 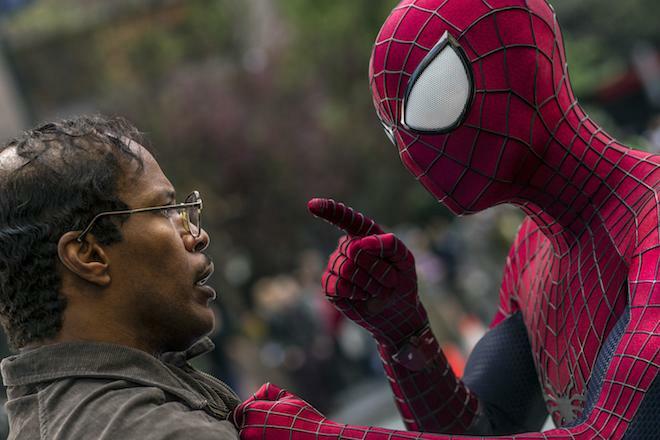 After a chance encounter with Max Dillon (Jamie Foxx), a nerdy employee at Oscorp who just wants a friend and to be noticed and Spider-Man, Dillon becomes a huge obsessive fan of the web-slinger. But when a freak accident transforms him into an electrical charged mutant who seems to resemble and have the same powers as Dr. Manhattan from ‘The Watchmen‘, his temper gets the best of him and he wants to destroy the city and Spider-Man. 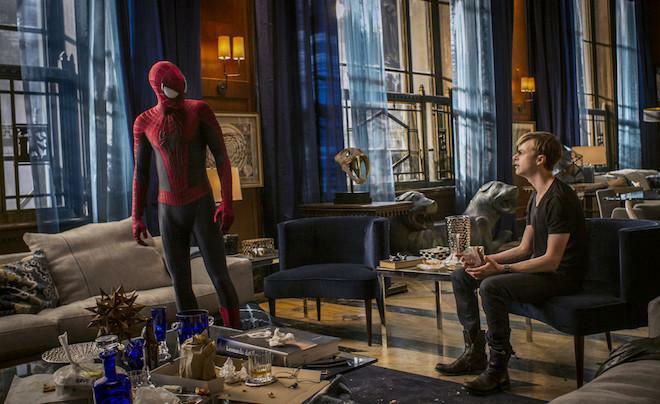 Meanwhile, we see Harry Osborn (Dane DeHaan, excellent) sit by his father’s (Chris Cooper) deathbed where Norman tells his son to carry on his legacy. Here is where we see Peter and Harry’s friendship that has been strained over the years, but the two pick up right where they left off and seem to have a great time together, despite everything that has happened. Webb decided to make the whole Green Goblin aspect an organic virus that attacks the body and changes your skin and eyes rather than a suite. There is a whole lot of X-Men type stuff going on here in Spider-Man with people turning into mutants and what not. This Green Goblin virus kills you, but Norman tells Harry before he dies that there might be a certain type of spider venom to prolong his life or actually cure him, since this virus is hereditary. So Harry asks Parker is he can get in touch with Spider-Man for a chance at getting some of his blood for survival. It doesn’t pan out so well for Harry so now it is Spider-Man vs. Electro and Green Goblin. The fight scenes are epic and a lot of fun to watch. Webb had Spider-Man use his web slinging abilities and surroundings to the fullest. I just can’t wait to get back and watch these action scenes again. There are some flaws with the film though. Electro didn’t seem to get the amount of time he deserved and should have been given a full movie to run with his character, instead of having to share with Green Goblin. And yes, Rhino is in the film, but not for more than a minute or two. I expect he will back in future sequels. But, Webb has big plans for the Goblin in future films as this one sets up perfectly as we get to see several other future villains for a split second. Other than that, the film was a solid sequel, and far better than what I though it was going to be. The Spider-Man one liners were excellent and funny and each relationship hit its mark. And of course, Stan Lee’s cameo was brilliant as always. I hope you enjoy ‘The Amazing Spider-Man 2‘ as much as I did. 'The Amazing Spider-Man 2' comes with an UHD 4K Blu-ray Disc as well as standard 50GB Blu-ray Disc. There is an insert for a promo for Sony. The discs are housed in a hard black plastic case. 'The Amazing Spider-Man 2' comes with an impressive 2160p 4K transfer presented in 2.40:1 aspect ratio. This title is one of the few very first releases on UHD and can be considered demo worthy for you early adopters. If you remember, 'The Amazing Spider-Man 2' was shot on 35mm film and transferred to 4K, which gives this picture a stunning image. The big differences with this UHD release and the former standard Blu-ray version is the upgrade in detail and richness in color. As far as the detail goes, there is much more definition and depth in the smaller details. The biggest change I noticed was in Spidey's suit, which looked phenomenal. Those shots where you see Spider-Man perched on a rooftop or standing on top of a building are where you can see the up-tick in detail in UHD. You'll be able to see each mesh line in the eyes and fabric stitching all over the costume. You'll even be able to see the shadow definition from the lighting across the suit, which gives it a lot more depth and richness. Each row of stitching in each of the superhero costumes are more pronounced and vivid. As far as makeup effects and hair go, there is also more definition to it all. Everything has more clarity and flows smoother when it's bouncing around or blowing in the wind. You'll be able to make out individual strands and locks of hair easier and see where makeup was applied heavier or lighter on some of the actor's faces. There is only a slight difference here with both versions, but it's noticeable. Wider shots of the cityscape, even at night have a ton of clarity, showcasing great detail in the old brick buildings as well as the new steel architecture. The colors here are fantastic, and when I say fantastic, I mean "fantastic and then some". The color spectrum, boldness, and richness of each color is highly upgraded. The red and blue on the Spidey suit is more vibrant and energetic, no matter if he's swinging from building to building or just standing in the street. Every color just pops right off screen. The clear blue skies are more pronounced during the daytime scenes as well as the electric light blue colors on Electro's skin and costume. The royal blue colors of the cap and gowns at the graduation are stellar as well and simply just ooze richness. Black levels are are deeper and inkier than they are in the standard Blu-ray version as well and standout quite nicely with the skin tones much smoother than before. There is a beautiful layer of grain that keeps up with its original 35mm print nicely as well. There are absolutely no artifacts, banding, or aliasing of any kind here. Each color jumps out at you with complete texture and richness throughout. While some upgrade are bigger than others, you'll be able to tell a big difference between the two versions, leaving this UHD video presentation demo worthy. This UHD release of 'The Amazing Spider-Man 2' comes with a great Dolby Atmos mix as well as a Dolby TrueHD 7.1 mix, leaving the previous DTS-HD 5.1 track out all together. For this review, I had a 7.1.2 Atmos speaker setup with the normal 7.1 surround with the added two overhead speakers and a subwoofer. The added overhead speakers do sound great, however it's not used as much as it could have been. Of course, the biggest upgrade you will see here with this audio presentation is in the heavy action sequences. The scene with the airplane is amazing with the fast winds and objects flying past, the Atmos sound really takes charge here, but not in a focal point sort of way, meaning these robust sound effects flow evenly and are well balanced with the other sound aspects of the film. During the thunderstorms, the overhead speakers do a good job of projecting the rainfall down on you as well, but it could have been a little bit louder and fuller. The better full-scape sound effects are when Spider-Man is swinging though the city and you can hear all of the city sounds and swinging effects overhead nicely, which gives it a very realistic presence as if Spidey himself is in your house. Perhaps the coolest moments with this Dolby Atmos sound are when Electro is yelling and talking in his deep new voice or when the Oscorp building hologram talks to the employees. It actually sounded like I was in a giant skyscraper lobby with the echo, bass, and full dynamic range here. When Spider-Man is fighting one of his many enemies here, every kick, web sling, punch, and hit sounds impressive, but never overly-done. Instead it mixes in well with the score and other ambient noises, which come through the rear speakers and other surrounds quite often. No matter how fast Spidey moves around the buildings to evade his attackers, the sound is seamless in picking up the little nuances of people chattering, cars honking, or other objects falling and flying around. Dialogue is crystal clear and very easy to follow as well. I did notice that the bass levels here were a little low and didn't pack enough punch in some of the heavier actions scenes. Don't get me wrong, they aren't too soft that they aren't heard, but it seemed like there was a limit to it and it could have been bigger in some of the more explosive segments. In the softer scenes of dialogue, the ambient noises are crystal clear and fantastic, giving the cityscape some air to breathe in all the nature and bustling city life sounds. This audio presentation is excellent. These two extras are the only two extras on the UHD disc, whereas all of the previous extras from the original Blu-ray disc are imported on the standard Blu-ray disc included in this set. There are NO new extras here. Audio Commentary - The writers and producers give a pretty informative commentary. Writers Alex Kurtzman and Jeff Pinkner and Producers Matt Tolmach and Avi Arad are here discussing all aspects of this production from the screenplay, to the technology, to the cast, cameos, and themes of the film. There is never a dull moment here. This commentary track was imported from the original Blu-ray release. Character Specific Highlights (UHD, 37 Mins.) - I'm not sure if this is considered an extra or not, but from the main menu, you can watch character highlights of Spider-Man, Gwen Stacy, all of the villains, and the Sinister Six from the film all rolled into segments of your choosing. 'The Amazing Spider-Man 2' is quite the fun film, both visually and story-wise. There is a lot of action throughout. The ending had a big cliffhanger for a third film, but unfortunately, that will most likely never happen. The new video and audio aspects in UHD are phenomenal and definitely worth the upgrade. The colors and detail are outstanding. The Dolby Atmos track sounds excellent, despite a couple hiccups. There are no new extras, however all of the previous extras are imported here on the standard Blu-ray edition, making this highly recommended!